Rainbow salad is just that. Bring up your salad game by adding all the colours of the rainbow to your plate. Go beyond green and add blues, reds, and purple by adding blueberries, beetroot, and purple cabbage. Add some mint or coriander to influence the herb note of the plate. Serve with a classic French salad dressing using lemon, olive oil and Dijon seasoned to taste. 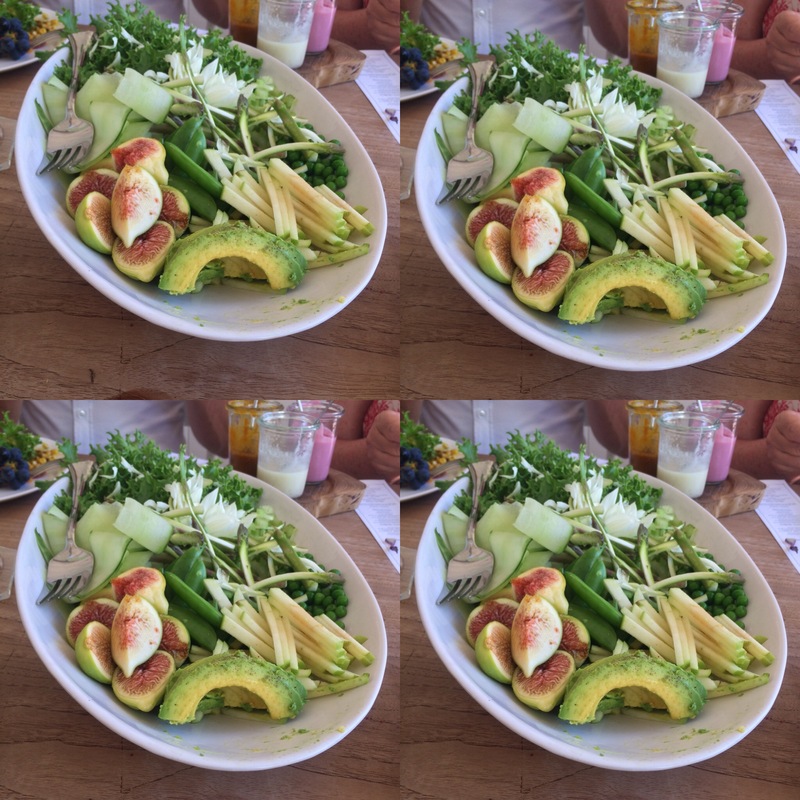 This salad is so fun to shop for and make or could even make different coloured plates according to the colours of salad ingredients. I first saw this serving style in South Africa when I was at a friends wedding at Bablyonstoren, a garden and vineyard. 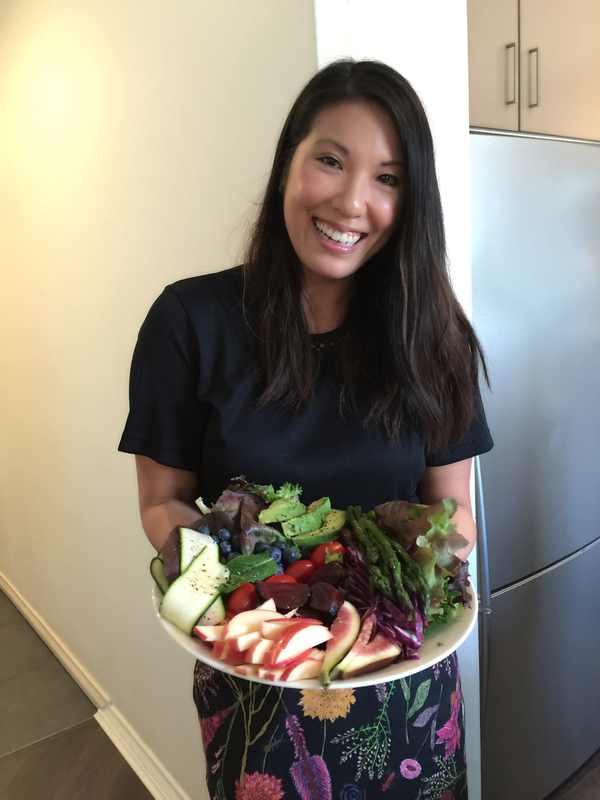 It was so good to eat these beautifully bright salads. I always think of them when I make a salad now! On this day I was invited to a friends for pulled pork burgers and volunteered to make the salad. 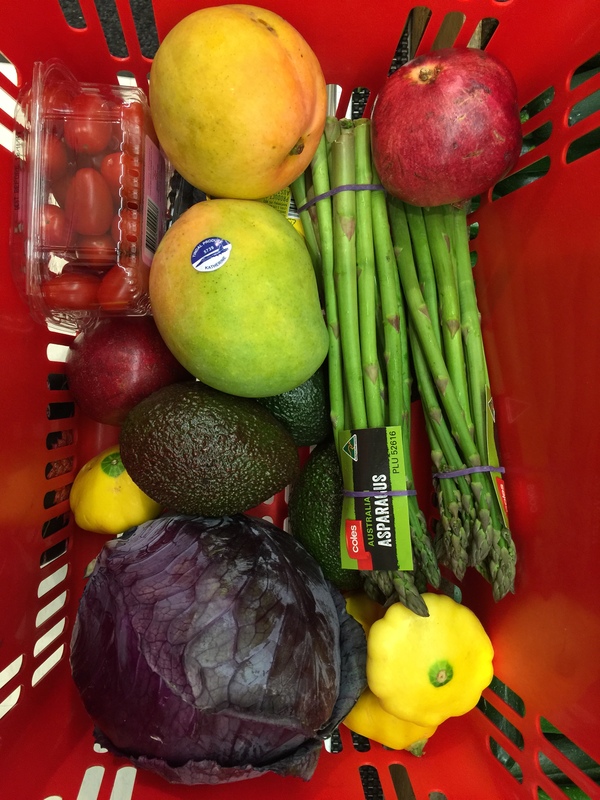 I went to my local Coles supermarket and filled the basket with a couple of my favourite items. Yellow squash, asparagus and purple cabbage. Then mint, blueberries and a pomegranate. Zucchini is another favourite vegetable so I picked up some of that too. 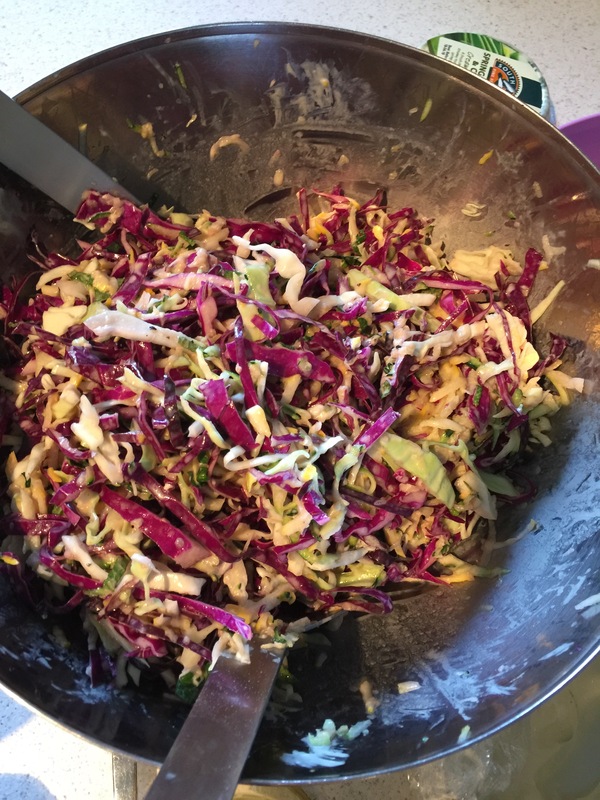 I had this idea for a rainbow slaw using red cabbage, zucchini and carrot which I also made on the day to go with pulled pork my friend Paul had made. Lots of lemons as well as a fig and a Fuji apple completed the basket. Simply wash and cut up your veggies and place them around the plate on your choice of lettuce according to colour. Serve immediately with dressing on the side. To make the dressing place equal parts olive oil, lemon and half the amount of mustard in a small jar. Shake and season with salt and pepper. Pour over to enjoy. For rainbow slaw: grate or finely slice 2 cups red cabbage to one cup zucchini and one cup yellow squash or carrot. Mix together in a bowl and drizzle with dressing. To make the dressing: start with the juice of one lemon. Add 2 tsps of mayonnaise and one teaspoon of Dijon mayonnaise and perhaps a drizzle of olive oil if you like. Season with salt and pepper, and mix through the vegetable mix. Since I was going to my friends house, I transported it in a large jar and then dressed it there. It was fun to eat. But here’s one of me with my rainbow plate!